Use Day & Night in HD resolution – our HD technology gives you crystal clear vision whenever required. Day & Night Vision in Millions of Colors – best hunting optic that fits the situation at hand! Ballistic Calculator – shifts Point of Impact on the fly letting you quickly calculate ballistics for any shooter’s needs. Easily determine exact ballistics for expert long-range and angled shots. Smart Range Finder – identifies the range to your target with two clicks. Once the distance is determined automatically adjusts your Point of Impact. 3-14 Magnification – Smooth Zoom offers fine tune adjustments for your perfect magnification every time. 1080p HD Video Recording & Photos, Recoil Activated Video (RAV) and Wi-Fi Streaming – allow you to record all of your hunting trips, using your phone/tablet as a viewfinder. Firmware upgradeable. The X Sight provides clear images, for all your day or night hunting needs. Use Day and Night in HD resolution – take your shots in color at high resolution, with no blurry images regardless day or night! 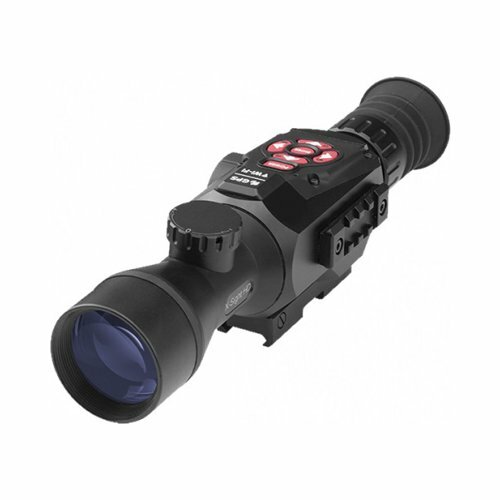 Smart Rangefinder – built-in rangefinder allows you to range your target without carrying additional equipment. The rangefinder will calculate the distance of an object from the point you are viewing. 3D Gyroscope and E-compass – The scope has a gyroscope built into them. The gyroscope keeps images steady and blur-free. Smart e-compass helps you navigate by showing you your heading. E-Zoom – lets you magnify to target without losing what’s in your FOV like with step zoom systems. 1080p HD Video Recording & Photos, Wi-Fi Streaming – allow you to record all of your hunting trips, you can use your phone/tablet as a viewfinder. Firmware upgradeable. Owning a high caliber, state of the art digital night vision riflescope is within your reach and all you have to do is say, yes!